I want to share with you the most delicious recipe that we've been enjoying lately. It is a recipe that came to us from Smitten Kitchen. If you haven't already taken in her mouth watering culinary skills, you most certainly should. Most of the time, I merely drool over her delectables...making mental notes of 'having to prepare that myself someday.' 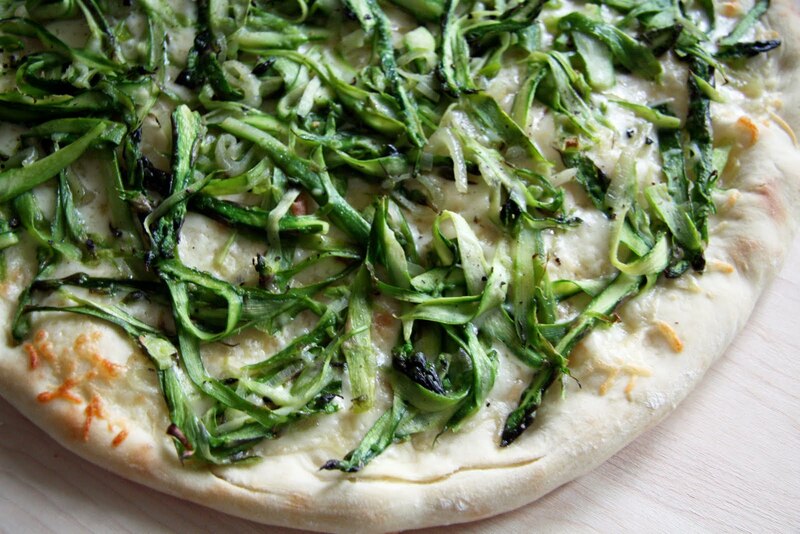 But my lack of follow-through changed a few weeks back when she sent a recipe for Asparagus Pizza. Go here for her delicious recipe. Below is my version, slightly modified for what I had on hand at the house. Saute sliced shallot in olive oil until cooked. 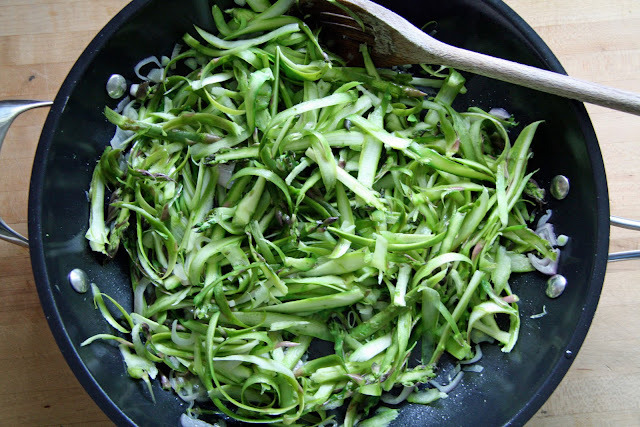 Throw in shaved asparagus and cook until slightly tender. Add salt and pepper to taste. 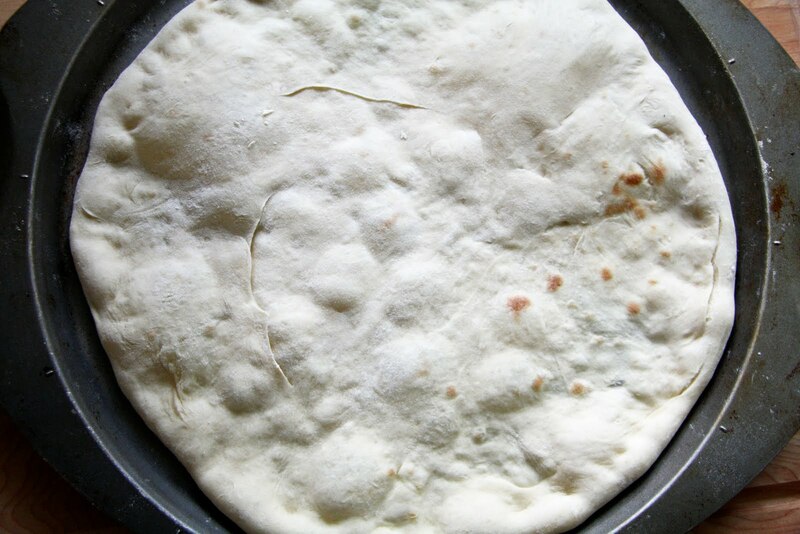 The pizza dough recipe is one I've used from the Moosewood Cookbook for eons. It never fails. Combine yeast, honey, salt and water in a large bowl. 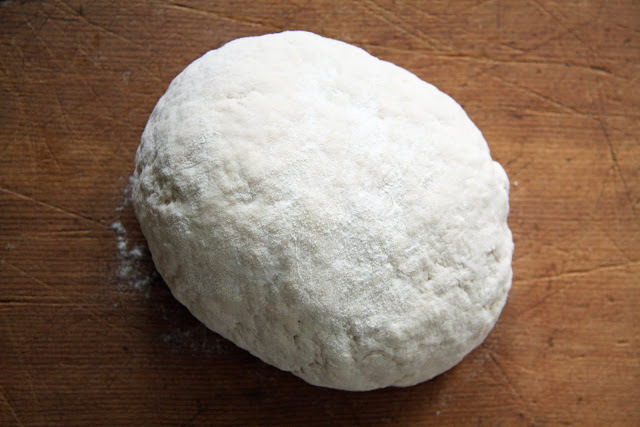 Add flour and knead into firm dough. Return to bowl and drizzle top with olive oil. Cover and let rise for at least an hour or until it doubles in size. The recipe makes two large pizzas. I roll out the dough on each pizza pan and then I bake the dough for a few minutes on 475 until it doesn't stick to the pan and is slightly golden (see above). 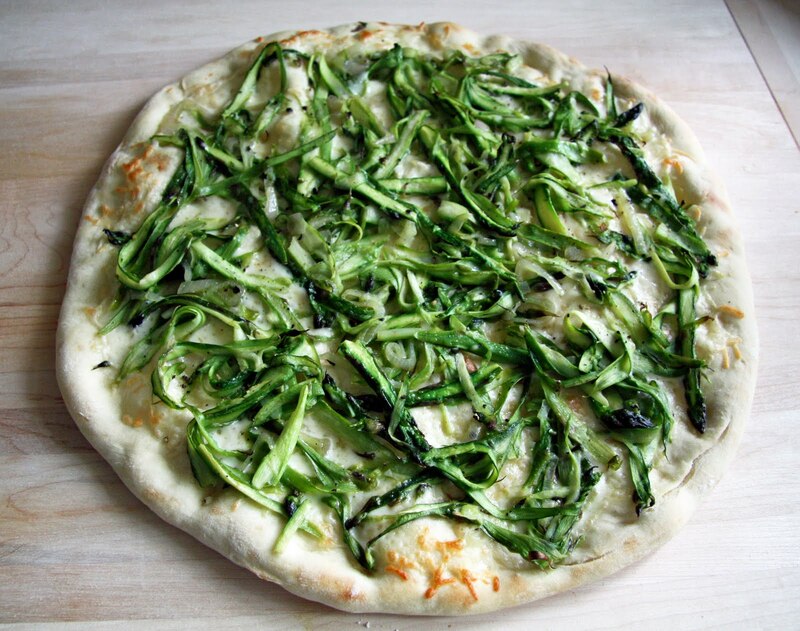 I remove from oven, add toppings (cheese and asparagus) and then bake for several minutes longer until cheese is nicely melted and crust is nice and golden. 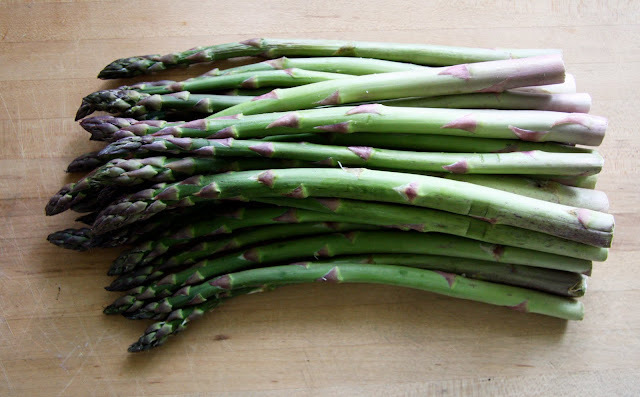 It's a wonderful way to enjoy lots of yummy asparagus while it's in season! It's also a perfect preview to the fresh tastes of all of the summer produce to come. My son's favourite food is pizza, and if it's homemade all the better. I will have to put this of my to-do list. It seems like ages since I left a message on your blog. I'm trying to find a balance with what I need to do and keeping up with my favourite blog reads. Just know that I am here and I have been trying to keep up!! Hope you have a great start to your week. Oh, that looks awesome. I have just been starting a pizza kick after having the most amazing gourmet greek pizza loaded with feta and olives and such. This looks divine. I will make it one day...SOON! Yum, i'd never have thought of it but it looks great :) I love homemade pizza! OMG it looks mouthwatering! Can you please teach me how to cook and PLEASE teach me how to take wonderful pictures like you do!!!! What a delicious looking tangle of green! This I must try!!! Thank you! This looks and sounds wonderful. One of my family's favorite meal is pizza on the grill. I just discovered your blog via Small Bursts via SITS - and I'm so glad. 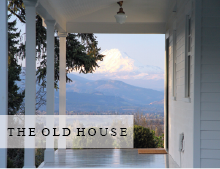 I've already spent time digging into your farmhouse remodel (and looooving it) and drooling over the peonies, and silver & white (me, too!). I love the feel of your blog and have to say it is relaxing. It is going to be my morning blog that I drink my tea over! we've been on a pizza frenzy here b/c the weather has not been too hot and pizza seems perfect. i will try this one for sure. it looks delicious. Trina...it looks and sounds delicious! Will have to try it. Hi Trina, it looks amazing! Thanks for dough recipe...I've had such a hard time for some reason making the dough. I end up buying premade which I'm sure greatly affects the taste of the "homemade" pizza! I don't like asparagus but I wonder if I could substitute spinach? Imagine all the wonderful pizzas we can create once our gardens start producing! I love the Smitten Kitchen, too! One of my favorite recipes is her Thick, Chewy Granola Bars. You can find the recipe under her Breakfast section. I'll have to try this pizza recipe. Especially interested in your pizza dough (I would add some wheat flour :)). I tried this fabulous pizza out tonight and it was absolutely delish!! SO YUMMY! I did add some green tomatoes and a sprinkle of blue cheese on top as well. My hubby and brother (who was here for a visit) LOVED IT! Thanks so much! Another yummy looking recipe. I hope these are all low in fat.